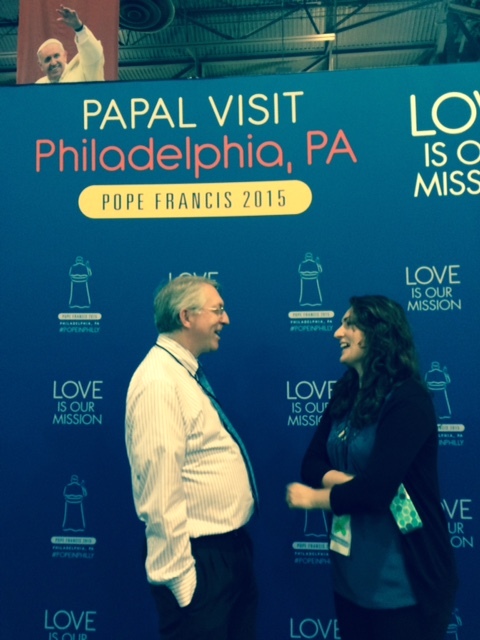 PHILADELPHIA – Jamie Lynn Black, a twenty-something Catholic communicator, says Pope Francis’ appeal to everyday people echoes the charisma she saw in Pope John Paul II. Like John Paul II, Pope Francis relates well to millennials, Black’s generation, and to immigrants, refugees, the poor, the homeless, even inmates in prisons. “He’s warm in a way that people feel touched by him, “ says Black, international communications coordinator for last week’s World Meeting of Families in Philadelphia. 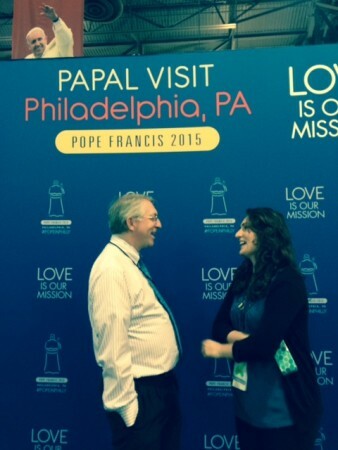 That Catholic festival’s final days coincided with Pope Francis’ historic trip to the U.S.
Jamie Lynn Black, an American studying in Rome, talks with her professor, Yago de la Cierva from the Pontifical University of the Holy Cross, during Pope Francis’ visit to Philadelphia. Black, 27, and a New Jersey native with an undergraduate degree in journalism, is studying towards a three-year degree in church or social communications in Rome. Her devotion to Catholicism—and subsequent interest in church communications—strengthened after she saw and heard John Paul II at World Youth Day in 2002 in Toronto. Though there are differences, she says both Francis’ and John Paul’s ministries were shaped by life experiences. “I think both want freedom for people. John Paul II saw communism as the oppressor, as something that was an affront to human dignity,” Black said, referring to that pope’s experiences in Poland under communist control. Francis, sometimes called the “people’s pope” because of his affinity for simplicity and reaching out, brings a new voice to modern religious and philosophical discussion, she said. Cecile S. Holmes, longtime religion journalist, is director of the journalism sequence at the University of South Carolina’s School of Journalism and Mass Communications. Pope Francis at the UN: Benedict Redux?